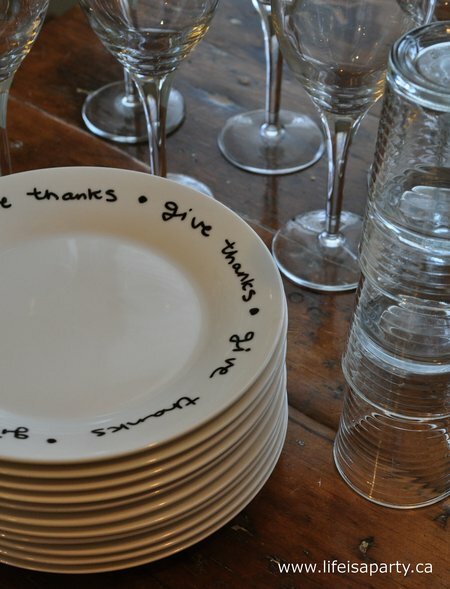 Knock Off Crate and Barrel Thanksgiving Plates: These DIY plates are easy and inexpensive to make for Thanksgiving or any other holiday. Use a special pen to add permeant writing to any ceramic piece. A while ago I was walking around Crate and Barrel, drooling over all the pretty things, like you do, when I noticed these cute plates. I really liked them and thought they’d be really nice for Thanksgiving, but at 9 something a piece, times 12, it was too expensive for me. I had seen on pinerest a few times, how people were using permanent Sharpie markers to write on china, and thought this might work to make my own. After a little more research, it looked to me that this method was hit and miss at best. I decided to use a ceramic marker for a more permanent effect. The ceramic marker was a hard to find …so I used the Decor Art glass paint marker. I was a little worried it would be too transparent, but it worked great, and looked like a regular marker which was the effect I was going for. 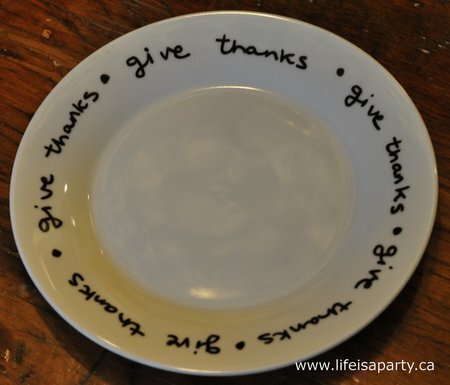 To find the side plates to write on I had a look at the dollar store but couldn’t find any that were a shape I really liked. 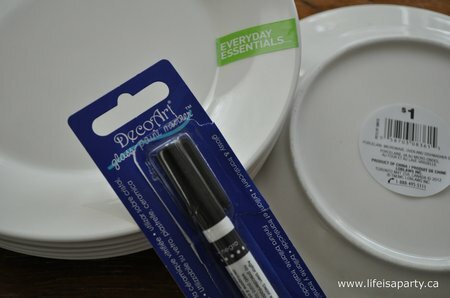 It was a happy accident to discover these President’s Choice $1 porcelain side plates, from their Everyday Essentials line, while grocery shopping. They were perfect. This project is really easy. Basically you use the marker to write around the edge of the plate. The hardest part of the project was figuring out the spacing of the words around the plate. With a little practise and a template to line up the dots between the words, it came together. You can remove the design if you’re not happy with it before it’s baked. You can try the writing and if you’re not happy with it just wash it off and begin again. After the design is finished the plates need to sit 4 hours. Then the plates get baked for 40 mins -according to the manufacturers instructions. They need to start out in a cold oven and be left to cool completely in the oven afterward. All the instructions are on the glass paint marker. One word of caution: the marker also says that it isn’t food safe. All the pictures of it being used show it on plates, glasses and cups. So, I guess the key is to only place the design on places where food will not come in direct contact. I thought these were fine, because the writing was just on the rim of the plate. 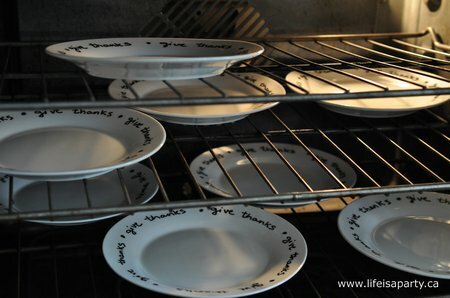 After the plates have been baked and cooled the writing should be permanent. They recommend hand-washing, so that’s what I did. 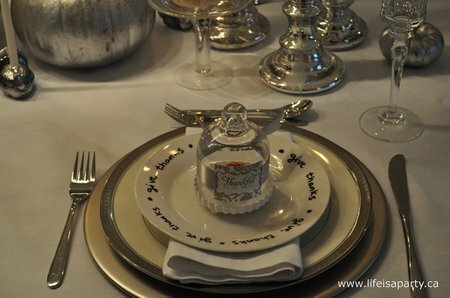 I used the plates for my Silver Thanksgiving table. I love how they turned out. At first, I did consider using a silver pen. In fact the pens come in a whole range of colours, including gold just like the inspiration plates. 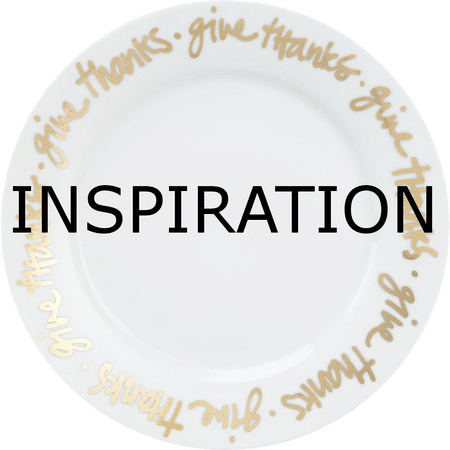 In the end, I decided that even though silver would have looked great this year, next year if I use oranges and browns for my thanksgiving table, the black writing would make the plates more re-usable. 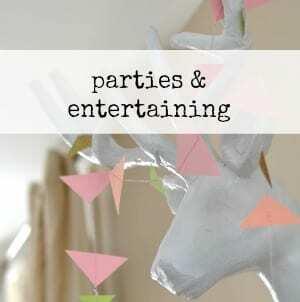 I have lots more ideas for Christmas and other holidays. 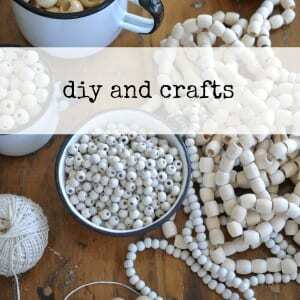 This idea is great since it’s so versatile, turned out great, and was really inexpensive. The Art Deco glass paint pen was $6.99 at Michaels. I used a coupon so it was only $5. The plates were $1 each, and I bought 12. The whole project was under 20 bucks. You can’t go wrong for that, even if you only use them once a year! 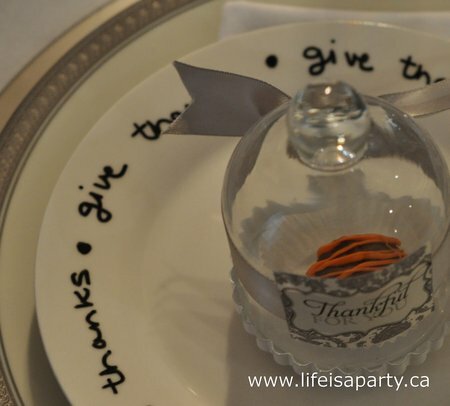 With DIY Thanksgiving Plates, life really is a party! What a wonderful idea. You were really thinking! Life really is a party when you find such generous and artistic hearts. I’m in awe. You did so well. I might steal this idea for Christmas… going to see if I can find that marker in my country. Thank you for creating this and thank you, even more, for sharing!!! 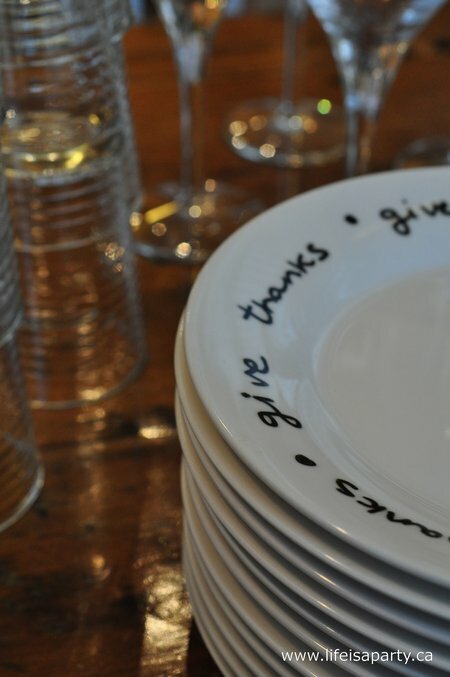 I love your setting with the message plates!! Bought the markers but haven’t tried this yet. Now I will. Liked your facebook page. Like me on facebook too at http://www.sewsweetvintage.com i have a fb box there:) I posted lacey ghost pumpkin to this party. I love your plates! I love how you’ve taken a concept and made it your own. It is daunting that it isn’t food safe. You’ve got me thinking! Such a simple idea with a big impact! 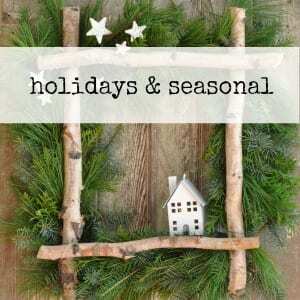 My mind is racing with the possibilities to tweak this for different holidays/events. These are lovely! I also like your plates better than the C&B version. Great job! 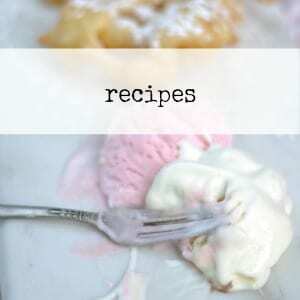 Really like your creativity, and your step by step directions. 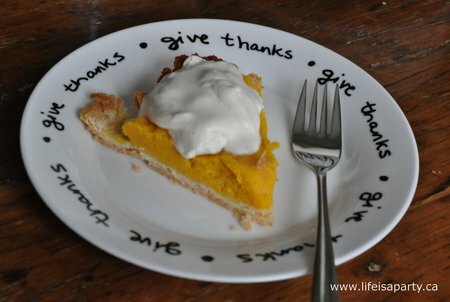 It seems like something I can do and I can’t wait to serve Thanksgiving dessert on my new plates. These are wonderful! Thanks so much for sharing the tutorial! Not sure what store you found the plates at? The plates are President’s Choice, so anywhere that sells that brand, like Loblaws, SuperCentre, etc. It’s only available in Canada I think, but you might find something similar at a dollar store. LOVE this! The possibilities are endless!! I love the idea. I am buying the plates at my favorite junk stores so each one is unique. I have done one with “you are my sunshine” and one with “jesus loves me”. If nohing else ‘lt sparks conversation and besides, I am having fun!! . I bought plates at the dollar store and wrote happy new year in many languages for the holiday of rosh Hashanna. Looks cute but unfortunately my handwriting is not a as nice as yours. I also found if I wrote it first with a dry erase marker I could get the spacing right and it just wipes off. So glad to hear you tried it! The Rosh Hashanna plates sound really great. Thanks for letting me know, and the great tip too. I found perfect plates with wide rim at WalMart for $.88! 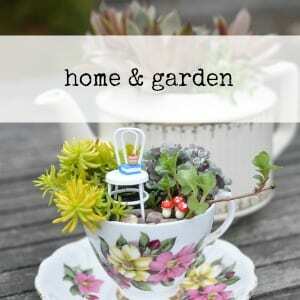 The brand is Better Homes and Garden. I can’t wait to try. Ann, that sounds perfect. Best of luck with the project.